You know that GST is indirect tax. It is given by seller but its burden has shifted to buyer. So, if the buyer is dealer who receives goods at higher rate, he will surely sell it at higher price to the final consumer. You can see if GST is 10%, final consumer receives goods at Rs. 131.10 and if GST is 20%, final consumer will receive same goods at Rs. 165.60. It means, he has to pay more Rs. 34.50 of same goods. 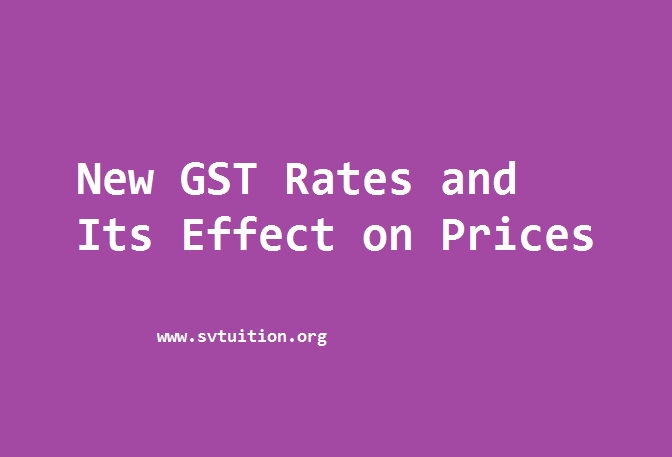 Now, come and check our current GST rates which had declared on 18th May 2017 in India. All most all the basic needs are free of GST. 1. Not all Dairy Products are not free from GST. are free from GST. So, there will no effect of GST on these items. Some Dairy Products will be costly now due to charging of GST 5% on these items. Railway ticket may be costly because now railway travel service will have 5% GST. Notebook will be costly due to 18% GST on it. For common man, all basic item, milk, vegetables, salt and clothes from jute are free from GST.